Smiling is always better if you are not self-conscious about your teeth being less than white, but as we age and with some foods that we eat and drink our teeth get darker. Recently, I put Smile Brilliant’s Teeth Whitening Kit to test and here’s my experience below. I am a tea drinker and it is horrible for your teeth. Yes, I brush my teeth and even use toothpaste that can whiten teeth, so they claim, but it’s just not enough for me to achieve that pearly white smile without staying away from food & beverages that can stain teeth. So when Smile Brilliant got in touch with me to do a review for their amazing Teeth Whitening Trays, I was so happy to say yes. Who doesn’t want a dazzler teeth?! 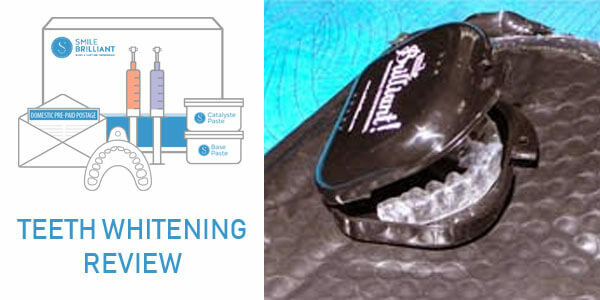 The Teeth Whitening Kit arrived in a slick Black Pillow Case that contains two molding trays, 3 sets of impression material (catalyst paste and base paste), 3 teeth whitening and desensitizing gels, prepaid envelop, return card, and very handy instructions. At first, I was wondering what to do with the items but with the detailed instructions I was able to figure that there are two major steps, (1) create a Dental Impressions (mold imprint of teeth) and (2) send it back to Smile Brilliant. With those impressions, Smile Brilliant will create a custom made tray and send it back to you. Making teeth impressions is super easy and FUN! You mix 1 base paste and 1 catalyst paste, place it in the tray evenly and then press it up to your upper teeth and then do the same for your lower teeth. It’s like playing with clays except that you have to be fast. I messed up my first mold because I enjoyed mixing it. Gladly, Smile Brilliant knew it was going to happen so they sent 3 catalyst paste and 3 base paste. How fool proof is that?! I do not want to give you too many details on how I did it because the instructions are so detailed and it’s fun to figure it out. If you’re wondering about the taste of the mold, it taste like a gum so no problem with it at all. The whole process only took about 5 minutes or less. When the impressions hardened, I cleaned and placed them into the prepaid envelope with the return card and sent it back to Smile Brilliant. Few weeks later, I get my custom fitted teeth trays in a compact case and started whitening my teeth. 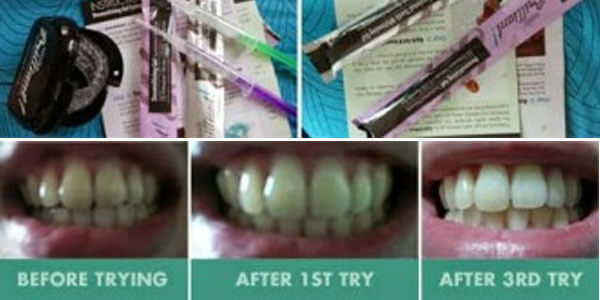 To whiten your teeth, use the gels that are included in your kit (from the first package). There are 2 types of gels, Teeth Whitening and Desensitizing. Teeth Whitening Gels are use to whiten your teeth while Desensitizing Gels are for pre-treatment to avoid tooth sensitivity. The gels are placed in a friendly-looking syringe (no needle) so it’s easy to use. You can leave the trays on your teeth for about an hour or so, it depends on your teeth sensitivity. You have to use the Desensitizing Gel first before using the Teeth Whitening Gel so you can maximize the Teeth Whitening Gel. The trays are comfortable and because they are custom fitted the amount of gels that gets into my mouth are reduced making it hassle-free. And the taste are not bad. You can talk or do other things while wearing it since you have to leave it for minutes. I had a problem doing other things, though, because I was drooling. The drooling is normal, I think, because I also drool during treatment with a Dentist that’s why my Dentist always uses suction on me. So far, I’ve had 3 sessions already and see great results! 1. Smile Brilliant Teeth Whitening Kit works for me and maybe for most but, for sure, not on everyone just like any other products. But Smile Brilliant clearly stated in their disclaimer that “results may vary from person to person” which is only fair because we have different teeth conditions. I prefer that than claiming that they can whiten ALL types of teeth discoloration which is impossible. 2. Yes, professional whitening treatment comes with a supervised and customized procedures but Smile Brilliant state that you consult your Dentist before using the product. Consultation is cheaper than whitening treatment, right? So ask your Dentist and he/she might even recommend Smile Brilliant. Plus! Smile Brilliant’s Whitening Kit is, most likely, the same product that you would purchase from a dentist. 3. Smile Brilliant Website is full of information that you can read and the instructions that come with the kit are full of cautions. Sometimes you just have to read to save some money. 4. Smile Brilliant offers a 30 Day, No Risk, Money Back Guarantee! 5. Smile Brilliant Teeth Whitening Kit works well with me! I have a whiter teeth in less than a week! Other than Teeth Whitening Kit, Smile Brilliant also has a LED Kit for whitening your teeth. Smile Brilliant is also shipping worldwide so you can have a white teeth wherever you are! The prepaid postage is only for US addresses but it’s cheap since the impressions that you will send back weight 4oz only. You can know more about Smile Brilliant and their products in their website or Facebook Page. Disclosure: I was provided the above products to review. Regardless, all opinions are honest and my own. You can click here to read our full disclaimer.